Ever had to manually dig through logs to find the one or two inputs that lead your controller software to break? STS seeks to eliminate this need, freeing you to debug the problematic code itself. STS simulates the devices of your network, allowing you to programmatically generate tricky test cases, interactively examine the state of the network, and automatically find the exact inputs that are responsible for triggering a given bug. For a detailed step-by-step walkthrough of STS's use cases, see this page. This will boot up pox, generate a simple 2-switch mesh topology, and begin feeding in random inputs. # Assumes that ./simulator.py has been invoked. # Assumes that ./simulator.py has been invoked, and terminated by finding an invariant violation. You can turn up the verbosity of the simulator's console output by passing the '-v' flag to simulator.py. The simulator automatically copies your configuration parameters, event logs, and console output into the experiments/ directory for later examination. See config/README for more information on how to write configuration files. Note that Hassel-C may not compile on Macintosh computers. The topology GUI depends on PyQt4. Will I need to modify my controller to use sts? 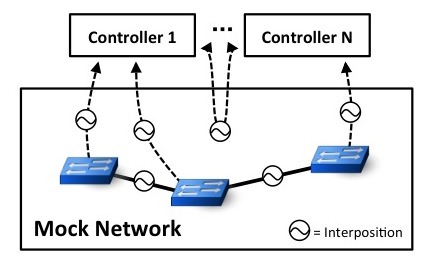 If your controller supports OpenFlow 1.0, STS works out of the box. You'll only need to change one line in the config file to instruct STS how to launch your controller process(es). For a high-level overview of STS's software architecture, see this page. For searchable code documentation, see this page. For an overview of how to generate dataplane traffic in STS, see this page. For more information about the research behind STS, see our paper or our talk slides.